Home - Random acts of kindness: Anglian celebrates A++ efficiency with an A++ competition! Feeling those winter blues? Need a little something to brighten your day? You’ve come to the right place. At Anglian, we’re all about those little things that give your day a bit of a lift, whether it’s coming home to a cosy, warm house, a tasty meal to look forward to, or a completely random act of kindness. A big part of what we do at Anglian is to help make sure your home is as warm, cosy, and efficient as possible. Our triple glazed window has been awarded an incredible A++ status for performance efficiency, which means these windows are excellent at keeping the heat in your home, gaining heat from sunlight, and the level of air leakage when they’re closed. 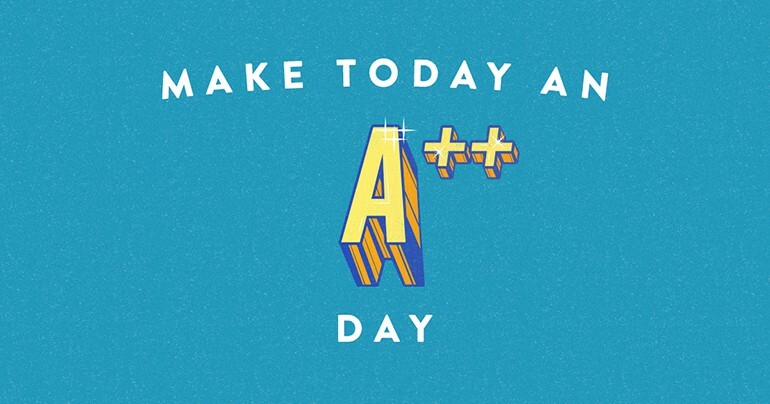 To celebrate our most efficient window to date, we want to bring everyone a little extra happiness by introducing our competition to help customers have an A++ day too! We’re launching a competition across our Facebook and Twitter accounts, in which we’ll be asking our followers to rate and describe their day in a social post using the hashtag #APlusPlusDay. Once a week for the next 3 weeks, we’ll choose one lucky winner to receive a little prize to help turn their average day into an A++ one! And finally, to help spread the cheer, we’ll also be providing some handy tips on how you can shun those January blues – check out our Facebook and Twitter to learn more. Our competition is running from Monday January 9th to Friday 27th, so make sure you get your social posts in! To read more about our new window’s A++ rating, take a look here. 1) These terms and conditions apply to the Anglian Random Acts of Kindness competition (“the competition”) run by Anglian (“the company”), and by entering themselves into the competition, entrants will be deemed to have read and accepted these terms and agree to be bound by them. Those who do not agree will not be entered into the competition. 2) The objective of the competition is for entrants to post on Facebook or Twitter about their day using the hashtag #APlusPlusDay. Anglian will choose one winner in total at random once a week from entries received across Facebook and Twitter. 4) This competition is open only to residents of the UK aged 18 years or over. Employees of the company, their families or anyone else associated with this competition or its operation are not allowed to apply. 5) All information detailing how to enter this competition forms part of these terms and conditions. It is a condition of entry that all rules are accepted as final and that the entrant abides by these rules. The decision of the company is final, and no correspondence will be entered into after the decision. Submission of an entry will be taken as acceptance of these terms and conditions. 6) To enter, you must: publish a social post rating and commenting on your day, including the hashtag #APlusPlusDay. The winning entries will be determined by the company, and the winning entrants will be contacted on the day of the competition, for each day the competition is run, via the social media account used to enter the competition. The final decision is binding and no correspondence will be entered into. The company reserves the right, at any time, to verify the validity of entries and entrants and to disqualify anyone who submits an entry that is in breach of the rules, or those that do not comply with content restrictions (defined below). Any entry which does not comply with these content restrictions, in the sole discretion of the company, will be disqualified from the competition. (d) Any works showcased on the site as winners will nonetheless be credited to those who submit them, highlighting their ability to produce winning entries or any that will be shortlisted in a “runners-up” collection, the size of which is at the company’s discretion. 9) Entrants agree that the company will be entitled to edit entries as it deems fit in accordance with current advertising regulations and will not be obliged to make any use of any part or all of a entry. 10) Entrants are solely responsible for Internet connectivity, software and/or hardware that may be required in order to create and/or submit any entry. 11) All entries must be received by the closing date of the competition. 12) Only one entry per person. No purchase necessary. Late, illegible, incomplete or corrupt entries will not be accepted. No responsibility can be accepted for lost entries and proof of transmission will not be accepted as proof of receipt. Entries must not be sent through agencies or third parties. 13) The prize consists of a handpicked gift that relates to the content of the entry submitted by the entrant, up to the value of £50. 14) The company reserves the right to substitute the prize (or any portion thereof) with one of comparable or greater value at its sole and absolute discretion. The winners are fully responsible for any and all applicable taxes in respect of the prize (including, where appropriate, import duty). All costs and expenses associated with receipt of the prize and any use not specified in these Terms and Conditions as being provided including, but not limited to, any and all expenses incurred by accepting the prize, are the sole responsibility of the winners. 15) By entering into the competition, the winners agree to participate in publicity following the competition, should it be required. This may include use of their name and image in online and offline publicity, communications, and in any other media worldwide without any fee being paid. 16) Events may occur that render the competition itself or the awarding of the prize impossible due to reasons beyond the control of the company and accordingly the company may at its absolute discretion vary, amend or cancel the competition without notice (in particular if it or the website on which the competition is operated is affected by any denial-of-service attacks, viruses, hacking or any other technologically-harmful material or act) and the entrant agrees that no liability will attach to the company as a result thereof. 18) The company will not be liable for any inability of any person to enter the competition because of any unavailability of such page, failures in computer systems or networks, other malfunctions, or for any other reason. 19) The company will not be liable for any problems or technical malfunction of any telephone network, cable, satellite, Internet Service Provider (ISP) or lines, computer systems, servers, or providers, computer equipment, software, failure of any email or entry to be received on account of technical problems or traffic congestion on the Internet or at any website, or any combination thereof, including any damage to the entrant’s or any other person’s computer related to or resulting from participation or downloading any materials relating to this competition. 20) All conditions, warranties and other terms which might otherwise be implied by statute or common law are expressly excluded from these Terms. 21) Nothing in these Terms will exclude or limit the company’s liability for death or personal injury caused by its negligence or for fraud or fraudulent misrepresentation. 22) Entrants agree that by entering the competition their personal details may be stored and otherwise processed by the company for the purposes of administering the competition and for the marketing and sending of other special offers where you have consented to receive the same. 23) If you have a comment, query or complaint about these terms or the promotion, please contact Anglian Customer Services,PO Box 65,Anson Rd,Norwich,NR6 6EJ. 24) The company may refuse to provide the prize in the event that an entrant fails to satisfy the eligibility requirements under these terms in clauses 5 and 7 above, or has committed or is alleged to have committed any act of fraud or dishonesty, or is in breach of any of these terms. 25) In the event of any dispute regarding these terms, conduct, results and all other matters relating to the competition, the decision of the company will be final and no correspondence or discussion will be entered into. 26) If any provision of these terms (or part of any provision) is found by any court or other competent authority to be invalid, unenforceable or illegal, the other provisions will remain in force. If any invalid, unenforceable or illegal provision would be valid, enforceable and legal if some part of it were deleted, the provision will apply with whatever modification is necessary to give effect to the commercial intention of the parties. 27) No failure or delay by a party to exercise any right or remedy provided under these terms or by law or any abandonment of any such right or remedy will constitute a waiver of that or any other right or remedy, nor will it preclude or restrict the further exercise of that or any other right or remedy. No single or partial exercise of such right or remedy will preclude or restrict the further exercise of that or any other right or remedy. 28) These terms and any non-contractual obligations arising out of or in connection with them will be governed and construed in accordance with English law. The courts of England and Wales will have exclusive jurisdiction to settle any dispute or matter of difference which may arise out of or in connection with these terms.